While it may have taken me some time to get into the routine of doing art while in Korea, I finished my time there with a frantic flurry of art, as I scrambled to finish before yet another self-imposed deadline. This last art piece was my coffee sleeve project. This piece, titled “Pieces of a Grant Year,” was displayed at Fulbright Korea’s Final Dinner, the last time all grantees gather before the grant year ends. I’d been fumbling with how I would display the piece – consisting of 55 cardboard coffee sleeves – but I arrived to find I’d been granted a table all to myself, where I laid out the pieces and displayed an artist statement. “Pieces of a Grant Year” is a collection of moments I experienced in Korea, from the mundane (students sleeping during self-study time) to the touristy (Beomeosa Temple, Busan) to the seemly insignificant but actually very influential (squatty potties). Why use coffee cup warmers, also known as cup cozies, java jackets or paper zarfs? Just because? Actually, the materials came before the plan. Thanks to encouragement from our own Hillary Veitch and my frustrated art drive, I began collecting java jackets in January. It wasn’t until many months and paper zarfs later that I decided to draw, paint and paste memories of Korea onto these pieces of cardboard. The concept was broad enough for any number of cup cozies and finding a connection to the material wasn’t too much of stretch. Cardboard cup warmers are always wrapped snugly around your cafe drink-of-choice, but afterward they’re nothing but trash. Cup warmers are insignificant physical tokens, whereas the memories I wanted to capture were meaningful but intangible. Through “Pieces” I give form to these memories, but only in snippets, the same way one might experience memories. The final component of this piece is up to you. The memories here are meant to be applicable to the general ETA experience. Our memories of Korea will eventually grow faint, but I’d like to think you could slip a zarf into your jacket pocket, fly back to America, and later look back on that piece of cardboard with some degree of fondness. So what I’m saying is, if any of these catches your eye, take one because my jacket pockets aren’t big enough for them all. This was a strange but fun project that I was excited to have featured on the Infusion website and make a cameo on another Fulbright-affiliated site. But in this post I’ll walk you through my process and highlight a few of my favorites. I might not have done this piece at all if it hadn’t been for a little encouragement from a friend. I was sitting with Hillary at a cafe in Seoul called Zoo Coffee, a cozy second-floor location in Hongdae, cutely decorated with stuffed animals and fairy lights. I remarked offhandedly that I bet I could do a cool art project with coffee cup sleeves, and Hillary said why not? I took the Zoo Coffee sleeve home after her urging – after all when would I be back at this cafe in Seoul? Of course I dedicated a coffee cozy to Hillary for her influence, featuring her rapper stage name HillaVanillaThrilla and her brilliant smile. I don’t know if coffee sleeves in Korea are prettier or there are more cafes, resulting in a greater variety of coffee sleeves. Maybe I just frequented a wider variety of cafes. Regardless, I’d been visually interested in them for a while. Collecting coffee cozies became a lot of fun. This one was beautiful as is, so I kept my addition small. I’d see an especially nicely designed sleeve on the street or in the trash and resist the temptation to pick it up. Walking around with my friend Arria, we’d notice people holding cups with standout coffee cozies and we’d squint to see the logo or examine the cafes we passed more carefully in the hopes of adding to my collection. I actually owe Arria credit for many of the coffee cozies I acquired; she’d visit me from Seoul and surprise me with donations, even though I still didn’t know what I’d be doing with these pieces of cardboard. I collected java jackets for a long time. I started around January or February and was still collecting new cozies in May. But although I had built up an impressive collection, I was still trying to figure out what I was going to do with these coffee sleeves. I toyed with a lot of ideas. Sculpture isn’t my strong suit, but I was working with a 3D material. I had to make good use of it. I racked my brain for ways to use the material in a smart and interesting way. I turned down ideas I thought seemed cheesy or like too much a stretch for the material. My sketchbooks accumulated many unhelpful sketches of zarfs. On one page I repeatedly wrote “zarf zarf zarf,” this being my favorite name for them. Finally I decided on the theme “Pieces of a Grant Year,” with each piece depicting a memory, even a mundane one, that other ETAs could take home – but you’ve already read the artist statement. I aimed to finish in time to display the pieces at Fulbright Korea’s annual Final Dinner in June, the last chance I’d have to catch our entire cohort of ETAs all in one place. I forced myself to stop collecting and start drawing. Regretfully, I didn’t use all the zarfs I’d collected. It was more work than I’d anticipated to do a different piece on every single coffee cozy. This project forced me to both exercise my artist and reflect on my two years in Korea. What were the most significant moments? What would be the most relatable? It required taking a step back from the culture into which I’d been immersed and remembering what was different or had been initially surprising. And then there was the material. What image would best match a particular coffee sleeve? Which coffee sleeve would be best for a drawing of an octopus in the fish market? Some zarfs were easy to match: my first one was a pen drawing of a cardboard collector’s cart, drawn upon a Starbucks sleeve to juxtapose poverty and a wealthy, international corporation. While I’d decided to draw on top of the coffee sleeves, there was still media to consider. I started off with pen and ink, but found the cardboard brown (and some select colors) were perfectly suited for colored pencils. I realized 24 set of colored pencils I’d bought at popcorn was only 5,000 won ($5) for a reason. But the colored pencil zarfs were some of my favorites. Colored pencils seemed to lend themselves naturally to food; either that or I simply gravitated toward food as a subject matter. But isn’t food often the thing we remember most about a place? Pen and ink was another common medium I used, useful for zarfs with a plastic-like coating. The pieces below feature Korean skincare products (all owned by me incidentally), Gamcheon village, and students sleeping during their “self study” time. As for the coffee cozies with black backgrounds, I had to pick up a white pen and marker. Featured are Jungwon University, where our orientation was held, and a roll of kimbap. During this time though, the Orlando shooting at Pulse took place, leaving 49 victims. Horrific details first leaked, then poured in over social media. The event shook me, especially having just attended Seoul’s Pride Fest the previous weekend. I was stuck with that helplessness felt after a major tragedy, coupled with the desire to create something just to process or give voice to these terrible emotions. But I couldn’t. I stopped creating instead. I gave up trying to create something beautiful to honor the dead and instead left these, two largely unnoticed coffee sleeves covered with the names of victims. I shook when I realized it took two to fit in 49 names. Art Abroad 2: Art Block Broken! So my first year in Korea wasn’t very artistically productive. It was more of an art drought. But my second year, I resolved, would be different! And generally it was, although my first few months started off not unlike my previous year. I’d recommitted to doing art, but like my first year in Korea, I was at a new school with a new homestay in a new city, and life was distracting. Mostly, I was concerned about making a good impression on my new coworkers and students. The new city that didn’t cause me any concern though…because I was placed in BUSAN! I’d wanted to be placed in Busan from the very beginning. Well, that’s not entirely true. At first I arrived in South Korea with no expectations, knowing that I wouldn’t get to choose my placement and it was pointless to set my heart on any particular place. That mindset didn’t last long. My peers had preferences all right, and were determined to get them. The more we talked about their preferences, the more I thought about mine, and the more appealing Busan became to me. I chose to teach English in Korea (not Japan or Malaysia or Taiwan) in part to meet my extended family. All of my mom’s family still lives in Korea, but I’d never been able to see them. And most of them lived in Busan, including my grandparents. Why wouldn’t I want to go to Busan? It was also my mom’s hometown and undoubtedly full of memories. Plus, Busan was pretty popular. It’s the second largest city in Korea,meaning it has nearly all the conveniences of Seoul (Costco, western style restaurants), without the crowds and pollution (I’m biased – can you tell?). Busan is also a coastal city with seven beaches, multiple famous fish markets and general awesomeness. So this year I was doing a lot of exploring and not a lot of art. But the thing about living in a beautiful place is that you can’t help but get inspired at some point. Remember when I turned down a coworker‘s suggestion to do landscape art? Well, that was before the ocean happened to me. Being from Colorado, I’ve always preferred mountains. This may have been influenced by the fact that I’d only been to the beach once in my life. 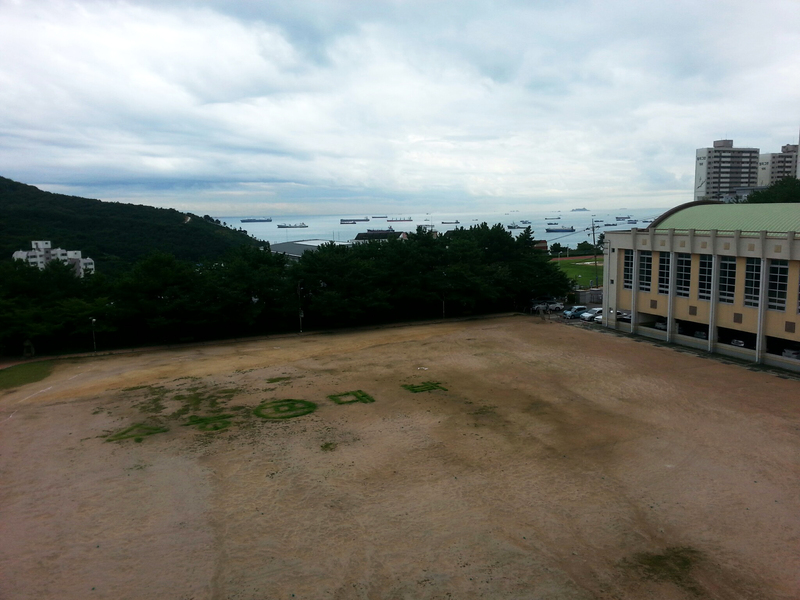 Busan opened my eyes. Being constantly surrounded by the ocean – really though, my school was on an island – all I wanted to do was sit by the sea. My daily commute took me right along the shore, so I’d rush onto the bus everyday, hoping to get a seat on the right side of the bus, where I’d have a front row view. Sometimes I wished I didn’t have to get off and go to school. I felt like I could just sit and watch the ocean for hours. I began to think “I just wanna draw the ocean all day.” So much for not doing landscapes. But it was still hard to find time for art. A new school meant new students, new coworkers and new expectations, both in the office and the classroom. None of it was bad; it just took a lot of energy as I learned what worked and what didn’t. I never felt like going through the effort of pulling out paints and brushes, and then finding a spot where I wouldn’t be disturbed. No art was created. Yet. I took the bus a lot in Busan which, unlike the subway, involves a lot of wait time. One day, during an especially long wait, I started playing around with a memo app on my phone, just as a way to practice color. And hey, it was actually kind of fun. Even if my first effort was horrendously ugly. I did another one of these mini digital paintings of the view from my office, this time not at the mercy of the bus’s arrival. It wasn’t so bad, although when I showed a coworker I made many excuses about how it was rough because I’d been using my finger to draw, but how it still wasn’t too bad right? And from that point on, I was addicted. Bam! Code cracked. Art block busted. Doing art was easy and fun again. I didn’t have to gather any supplies – all I needed was my phone, which never left my side anyway. I feel silly that it took me this long to start making use of technology in my art. I know what you’re thinking now – or at least, what I was asking myself – didn’t you do any other art? Well yes, yes I did. Keeping with my anti-landscape theme, I did physical landscape paintings as well. They were really small goodbye gifts to a few people before I left Korea. And seeing as my family was a big highlight during my time in Korea, they got a few pages in my sketchbook.